The Ugly Truth of Abortion on a Sign Saved a Baby! When they approached, we thought maybe they could be coming for an abortion, but turned out, they wanted to thank us for being there! 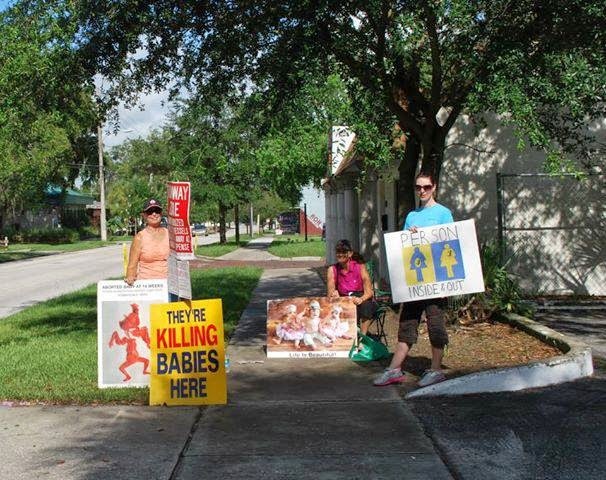 The mom shared how years ago when they had lived in this neighborhood, they would drive by and see people standing out in front of this abortion mill with signs, including pictures of the babies who died from abortion. She told us that they effected her children to the point of tears at times. Fast forward to the present as she then shared with us that her 15 year old daughter came home one day and announced the news that she was pregnant. Of course she was shocked, but being pro-life, she unwaveringly stated that she would stand with and help her through this time. Others, though, were encouraging and pressuring her to have an abortion, to the point that she even made an appointment! continual basis when she was younger. She kept thinking about them and finally realized that she could not do that to her baby! The pictures of the innocent little ones who had died the painful and brutal death of abortion on those signs saved this babies life! They joined us another time at one of our Jesus Loves the Little Children Day and then yesterday was the baby shower and what a glorious celebration of life it was with this young lady surrounded by family and her "Life" friends as her mother calls us! I want to thank those that stood unashamedly in front of the EPOC abortion facility many years ago holding the ugly truth of what abortion really is; the innocent little victims, the babies. Yes, these pictures aren't pretty, but they are the truth, and the truth is what sets us free! There is alot of controversy even in the pro-life community on the use of these pictures, but for me, throughout the years, I have seen so many babies saved and are alive today because somebody was holding a sign with one of these pictures, or a Truth Truck driving through town or parked somewhere. Let us never, ever be afraid of sharing the truth!